Do you remember earlier we had told you that there are more Indian teenage users on Facebook than USA? Now a recent report by research agency eMarketer confirms that not only on Facebook, but compared to all the countries in the world, India is all set to have the highest growth in social networking! Due to the saturation level in the developed countries which had spearheaded the growth of internet penetration, a slowdown was predicted. But this year, as per estimates, 1.61 billion people will log in to social networking sites at least monthly, from any electronic device. That’s a 14.2% gain on social networker numbers from 2012, and double-digit growth is expected to continue for another year. 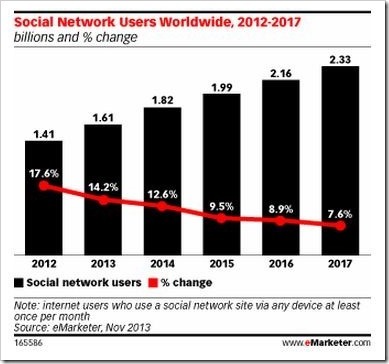 By 2017, 2.33 billion people will use social networks. Which countries are on the top now? Currently, the highest penetration of social network users as a share of total population occurs in the Netherlands, where 63.5% of all residents are social network users; Norway follows just behind at 63.3%. Majority of residents in Sweden, South Korea, Denmark, the US, Finland, Canada and the UK also use social networking sites actively. Who is driving the future growth? When the developed countries are near saturation, the fastest growth in social network usage is happening in less-developed markets. India, with the highest growth this year, will increase user numbers by 37.4%, while Indonesia’s numbers will climb 28.7% and Mexico will grow its social network user base by 21.1%. India has a very high population and an expected growth rate. India’s social network penetration currently stands at only 7.7 percent, below the average of 22.7 percent worldwide. With the huge potential in the near future, driven by the falling prices of internet-enabled devices (read mobiles and tablets) and 3G rates as cheap as 2p/10KB along with a highly aspirational population which loves to show-off (you can see lots of cycle-rickshaw guys with a smartphone in the Indian capital), India is destined to be the social networking king. Social Networking and Facebook are now spoken of in the same breath. India, Indonesia and Mexico are also high-growth areas for Facebook, the world’s largest social network, which research says will reach a worldwide monthly user base of 1.026 billion this year. Currently, US remains the single country with the greatest number of Facebook users, at 146.8 million this year, and India comes second, though a distant one. But with India’s large population and high expected growth rate, it is believed it will develop the largest Facebook population of any country in the world by 2016. Did someone say China? Since Facebook is banned in China, we assume there are no (or very few) users of the social network in the country. So its advantage India all the way for now. Will we see an entire ecosystem flourishing around social networking now, just to ride the wave? 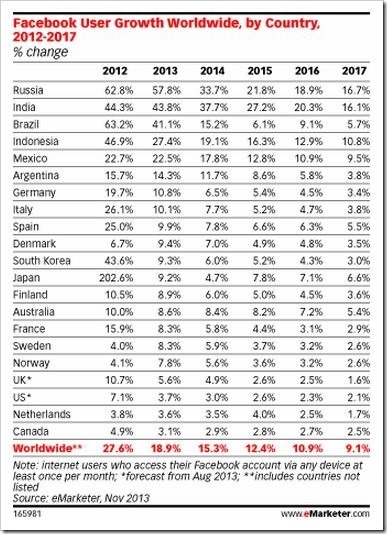 "India Leads Social Networking Growth Globally, To Have Largest Facebook Users By 2016", 5 out of 5 based on 1 ratings.